Danna founded AVA School Solutions to ensure that all students, K-12, have every opportunity to succeed in school, by removing treatable vision and hearing conditions. These conditions were unknown barriers affecting students’ achievements and well-being. State-mandated hearing and vision screenings are essential. Yet, they create a very real burden for schools. The paperwork and process is daunting, leading some schools to not complete the screenings. AVA’s app and software provides the help schools need to not only identify the students that need interventions, but to follow up and ensure that the interventions were completed. SEED SPOT is a continual source of connections, work space, and opportunities. SEED SPOT’s Board Member and Mentor, Michael Ellenby, provided game-changing advice, communication and expertise. My company certainly became more because of my time with Michael. SEED SPOT’s Vice President of Communities, C’pher Gresham, serves on my Advisory Committee. SEED SPOT Committee Member, Daniel Jones, has become an instant connection and resource. SEED SPOT Schools Strategic Advisor, Gretchen Naugle, continues to connect me with schools and share leads. We serve pre-schools, K-12 public, private and charter schools, as well as home school organizations. We are also assisting businesses that provide screening for schools. Screenings are important, but outcome is everything. AVA helps schools get their screenings done and assists with state compliance. Most importantly, our service communicates directly with the families and continually tracks follow-ups. Identification without intervention helps no one. AVA puts the focus on the outcome. As an entrepreneur, you jump a new hurdle everyday. Entrepreneurs are literally creating new pathways that didn’t exist before. You can speak with experts and learn from those who went before you, but at the end of the day, your path is your own. This creates a breeding group for self-doubt, judgment, and fear. You may have to give things up like sleep and exercise but never give up on your WHY. If you truly care about your WHY, you will be able to face the doubt and fear and judgment and deal with the lack of sleep and endless deadlines. However, if your WHY isn’t powerful enough, your tired, terrified self will likely cave. The hurdles are endless. Your WHY is your willingness to keep jumping. AZ Tech Beat labeled AVA School Solutions the next Ed-Tech superhero for children. Danna presented the solution to the Arizona State University Executive Masters in Sustainability Group. They discussed how AVA School Solutions helps the environment by eliminating a significant amount of paper waste by capturing and processing school health screening data electronically. 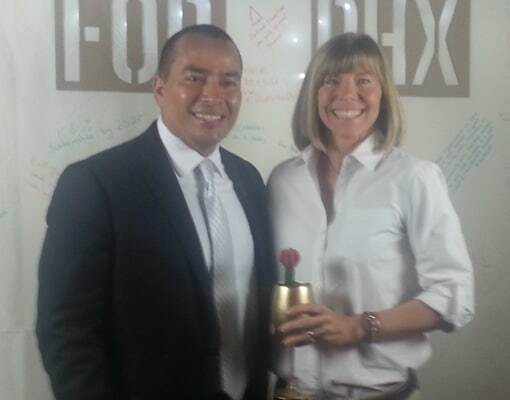 AVA was 2016’s Arizona winner for the 1776 Challenge Cup and received the award by the the Vice Mayor of Phoenix. Danna and her team recently completed a successful 15-school pilot of the AVA app and are planning to debut AVA at the Arizona School Nurses Convention this summer. They are also excited to have been invited to serve on two committees for Eyes on Learning, an Arizona statewide initiative founded by The Virginia G. Piper Charitable Trust. Working with the Trust is a DREAM come true for us! Later this year, AVA will begin collaborating with GSVLabs in San Francisco, an organization committed to supporting Ed-Tech companies that can deliver technologies that transform education. They are thrilled to be working together!